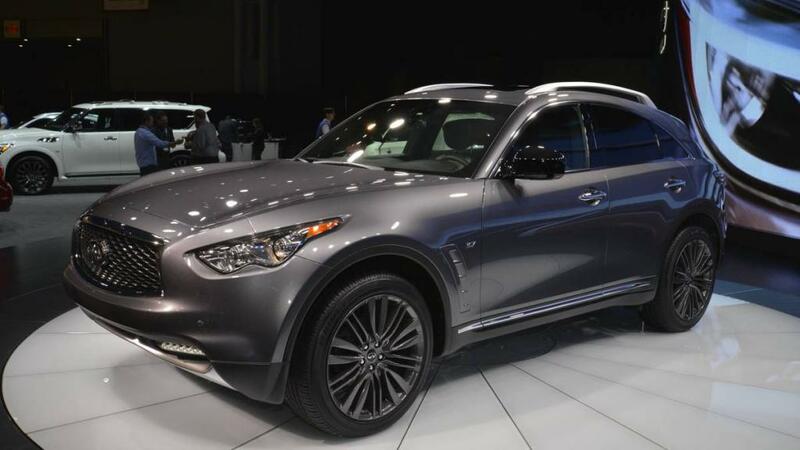 We had been told about the new Limited trim for the 2017 Infiniti QX70, but now it has made its official world debut at the New York Auto Show. The new Limited QX70 will go on sale this summer in both rear- and all-wheel drive configurations. As of yet there have been no pricing announcements, but we do know that the QX70's base price is $45,850. The 2017 Infiniti QX70 Limited is a cosmetic package for the vehicle. As such, there are no modifications to the 325 horsepower 3.7L V6 engine connected to a 7-speed automatic transmission, which is standard in the QX70. So what is visually different about the QX70 Limited? The QX70 Limited has a litany of changes to both the interior and exterior. First, the exterior: a unique front fascia, LED daytime running lights (replacing the standard QX70 fog lights), a new grille design, body-colored side air vents, dark-finish outside mirror housings, dark-finish rear combination lamps, a stainless steel rear bumper protector, and unique 21" premium paint-finished aluminum wheels. And now, the interior: there is a special high-contrast Graphite and Stone-colored treatment, a dark-color headliner, special open-pore wood trim with aluminum flake trim on the console, deep pillow quilting on the centre console, and aluminum-trimmed pedals. The QX70 Limited also comes with a host of safety technologies. Those include: Around View Monitor with Moving Objection Detection (MOD), Intelligent Cruise Control (Full-Speed Range), Lane Departure Warning (LDW), and Lane Departure Prevention (LDP). Thanks to start this thread. It is useful for me.